3315 Square Feet with 4 Bedrooms + Bonus Room! Reduced! Location Location Location! Beautiful 4 Bedroom plus bonus room home on a premium pie shaped lot with stunning Panoramic Views you can enjoy from the backyard, dining room, kitchen, kitchen eating area, and master bedroom. Quiet cul-de-sac location. One bedroom and full bath downstairs, Gourmet kitchen features include Granite Kitchen with tumbled travertine backsplash, Coffered ceiling with recessed lighting, stainless steel appliances including dishwasher with upgraded gas stove, custom cabinetry, Spacious formal living room with soaring vaulted ceilings and dual sided fireplace opening to the formal dining room. Comfortable floor plan offers both formal living room and family room with crown moulding. Inside laundry with laundry room sink. Large master bedroom suite with striking views. Granite counters in master bath with separate shower and tub. Large Dual sink secondary bathroom upstairs. Huge wrap around yard with room to roam equipped with a jacuzzi tub on the side of the home. All this located just a few minutes from the beach. Kite Hill HOA amenities include: pool, spa, club house, tennis courts, basketball court and volleyball court, club house, tot lot and more! ⟵Just Listed! 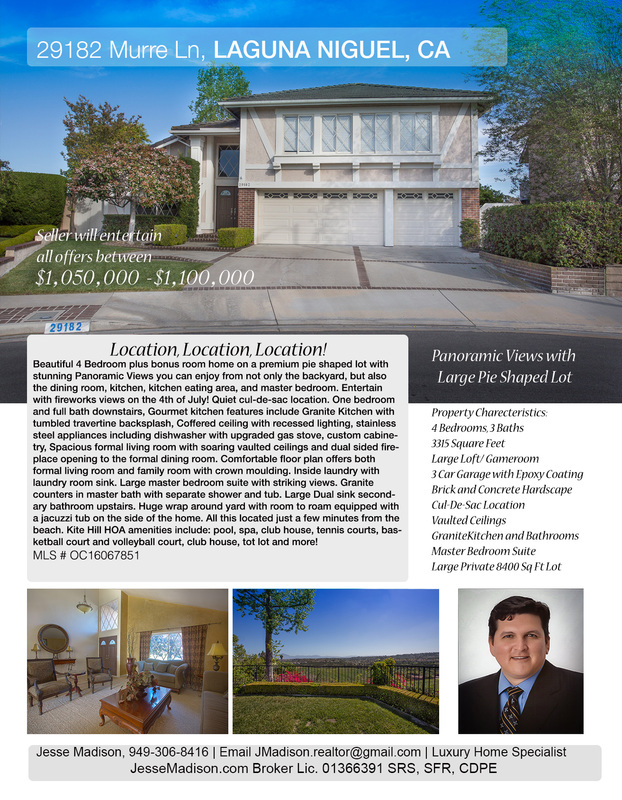 Beautiful Kite Hill Panoramic View home in Laguna Niguel!